We decided to slip one more patch in! The patch will be available on the Beta Branch of Steam for a few days. Please jump in and let us know what you think. The patch will go live soon after that. - Fixed an issue with the Company Captain's Cap confusing party members when they cast a buff/heal spell. - Realized we went a little overboard on the Deadfire Uniforms. We knocked the defenses they granted from +20 to +9. - Added optional analytics. This is just simple data collection (where parties wipe, which classes players choose, etc....). A pop up will trigger as soon as you launch the game after patching, asking 'would you like to enable analytics.' We'd love it if everyone did, but feel free to just click 'no' and forget it ever happened. Completely quit out of the Steam client. Restart the Steam client and navigate to the Library tab. 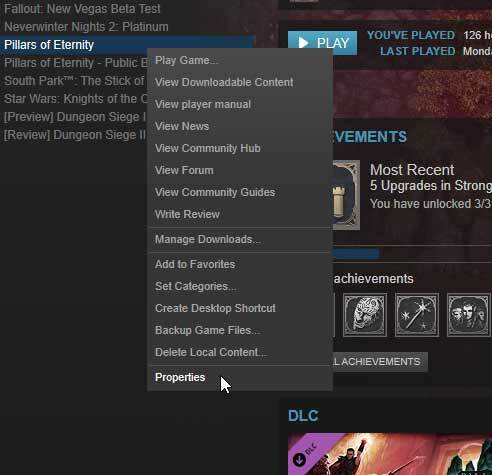 Right-click on the Pillars of Eternity entry and click on Properties. Navigate to the Betas tab in the Properties menu. Enter in the code "BETAPASSWORD" (remove quotes) and click on the Check Code button. Click on the dropdown list and select the "beta" branch. Once selected, close out of the Properties menu. 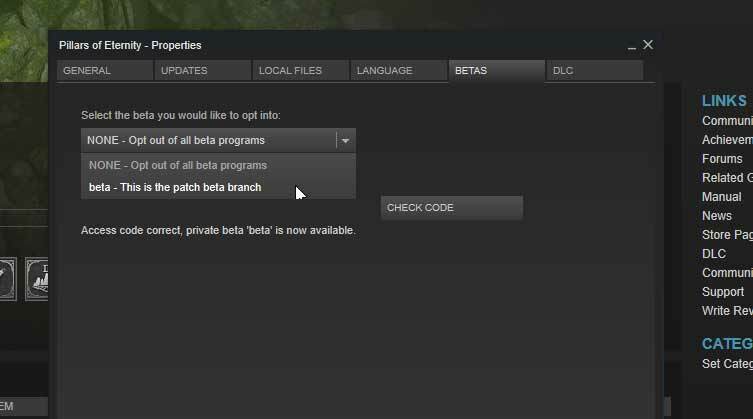 You should notice that your Pillars of Eternity game will now have "[beta]" after it. This means that your game is in the beta branch. Steam should queue an update for this branch. You can now play the new beta branch of the game. If you would like to switch your branch back to normal follow steps 3 and 4 to get back to the Beta tab in the Properties menu, then choose "NONE" as your branch. This should revert you back to the release version of the game. Thank you to all of the folks that decide to play the patch beta and help report issues. Your help is invaluable and we really appreciate your dedication. Added optional analytics. This is just simple data collection (where parties wipe, which classes players choose, etc....). A pop up will trigger as soon as you launch the game after patching, asking 'would you like to enable analytics.' We'd love it if everyone did, but feel free to just click 'no' and forget it ever happened. Edited by draego, 19 December 2017 - 02:42 PM. I did steps 1 to 5, and I get "Access code for beta is incorrect" at step 6 (translating from Swedish so I don't know if those are the exact words but it's pretty much the jist of it). Edited by Osvir, 19 December 2017 - 04:10 PM. I'm on GoG, so I cannot get the beta patch to do this myself. Thx. It looks like this on all the male characters regardless of what color I choose for them. I hope it gets fixed, small as this issue is, it's still an bit annoying. On a unrelated note, the new female orlan portrait rocks (just like the previous one, thank you orlan-favoring lady backers). Bummer. I think Kana would look perfect in this outfit if it wasn't bugged... Is this something a modder with access to unity could fix? I saw a few outfit swap mods out there, so it should be possible to tinker with the files. I dare to guess the rendering issue with the blurred backgrounds also wasn't fixed, because almost nobody seems to notice or write about it - which I find strange by the way, because it bothers me quite a bit. Well, this probably means I can stick to my patchwork 3.06 / 3.07 mix... (basically 3.07 with the Assembly-CSharp.dll version from 3.06 to prevent the blurry backgrounds.) I don't use the soulbound cap and don't really care about the armor nerf. Edited by Cerebro83, 20 December 2017 - 11:13 AM. I guess I should abandon all hope that traps will ever be fixed. Maybe it would also be possible to include some of the community fixes? What about the uniforms being all white and not transparent in sneak mode? When I enter this BETAPASSWORD it tells me invalid. What should I do? I wish u'd update on console too. Its tripple the price for a much older version of the game. The Beta Branch has been pushed to the live branch and is now live on Steam with the fixes above! Patch 3.08 is coming to GOG as well, correct?? This patch is 1.6 GB. I really hope its more than 2 fixes and analytics. Otherwise it would be nice to ask us to opt in before downloading 1.6GB and taking up that space regardless. Correct, it typically takes a few days for GOG. Edited by Cerebro83, 03 January 2018 - 01:17 PM. It was 2.4GB for me - not that it's an issue for me personally (100/100) just wanted to add more statistics. Well it does look like a change in shaders / texture filtering - or they simply changed the quality level corresponding to each 'notch' on the quality sliders in settings, i.e. maybe 'normal' now is equivalent to the old 'low', 'high' is equivalent to the old 'normal' etc. (or any other custom change to 'default' levels of quality). Assuming I can increase the quality to match the old look if I so prefer, then I think it's perfectly ok if the drop in default-quality also gives a proportionate increase in default-performance. Edited by AnorZaken, 03 January 2018 - 03:48 PM.